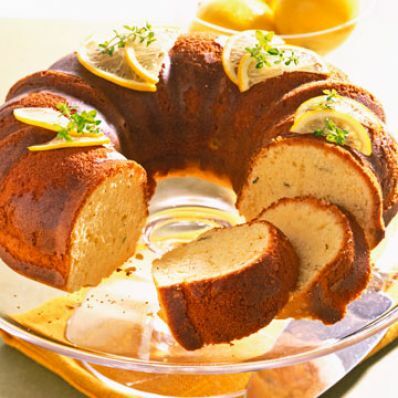 1 of 3 Heat oven to 350 degrees F. Grease and flour 10-inch bundt pan. 2 of 3 In bowl, mix flour, thyme, baking soda, cinnamon and salt. In large bowl, beat butter, sugar and extract until fluffy, 3 minutes. Beat in eggs, one at a time, beating well after each. In bowl, combine yogurt, lemon juice and zest. On low speed, alternately beat in flour mixture with yogurt mixture in 3 additions, beginning and ending with flour. Pour into pan. 3 of 3 Bake in 350 degree F oven 55 minutes, until tester comes out clean. Cool on rack 10 minutes. Remove cake from pan. 1 of 1 In small saucepan, combine lemon juice, sugar and thyme. Over medium-high heat, stir until sugar is dissolved. Boil, without stirring, until syrupy, 10 minutes. Strain. Let cool 5 minutes. Brush over cooled cake. Per Serving: 14 g Fat, total, 56 g carb., 8 g sat. fat, 112 mg chol., 1 g fiber, 149 mg sodium, 6 g pro., 371 kcal cal.